Osaka is one of Japan’s largest and most popular cities. It’s located in the Kansai region of Japan, quite close to the ocean. Osaka is mainly known for its fresh fish, amazing street food and great nightlife scene. During our trip to Japan, we stayed in Osaka for three nights. We only had one full day to explore the city, as we took a day trip to Nara and travelled back to Tokyo the day after. If you are also on a tight schedule, here is the perfect itinerary for one day in Osaka! 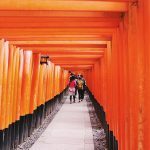 Where to eat/drink in Osaka? There is so much to see in Osaka, and I’m sure we wouldn’t have been bored if we would’ve stayed a few more days. Unfortunately, we only had a limited time in this beautiful city because of our planned itinerary. Here is what we did in one day in Osaka. Osaka Castle was on the top of my list when it came to things I wanted to see during our short time in Osaka. This beautiful castle is one of Osaka’s most famous landmarks. It played a major role in unifying Japan back in the 16th century, and you can learn all about it inside! After getting some breakfast near our hotel, we got on the metro to Osakajokoen station. From there you can walk to Osaka Castle. Give yourself enough time to explore the beautiful places surrounding the castle. There are tons of little stands around the castle where you can buy street food and try. You can walk around the castle freely, but entering it costs ¥600. Inside the castle, you will find a museum dedicated to the history of this beautiful building. You can also climb to the top for a beautiful view over Osaka. Four hours might seem like a long time when you’re on a tight schedule, but you really need it when you want to explore the castle properly. Dotonbori is the bright heart of Osaka. This is where the Osaka comes to life at night. If you’re looking for things to do in Osaka, you might have already come across this famous street. It is filled with bright lights, amazing restaurants, shops and some famous landmarks like the Glico man and the 6-meter crap! After visiting Osaka Castle, we jumped back onto the metro at Osakajokoen and travelled to Namba Station. From here, Dotonbori is just a few minutes by foot. 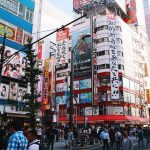 Dotonbori is the perfect place to try all sorts of amazing street food – more on what types of food to try later. But it’s also a great place to sit down and have dinner, grab a few drinks, do some late night shopping and play in the arcades! Near Dotonbori, you can find another famous landmark in Osaka: the Glico man. The sign was first installed in 1935 and has been altered 6 times since. It is such an iconic picture of Osaka’s brightly lit Dotonbori. After enjoying dinner, some shopping and a drink in Dotonbori, we slowly headed back to the hotel. Our hotel was located near Osaka Central Station, so we took the metro back there. Before actually going back to the hotel, we had another walk through the neighbourhood. We spotted a cute little bar where we spent the rest of the evening: Aquarium Bar Kind. The bar is filled with fish tanks, which I find such a cool and unique concept! Because we were on such a tight schedule, we didn’t have time to visit the famous Osaka Aquarium. 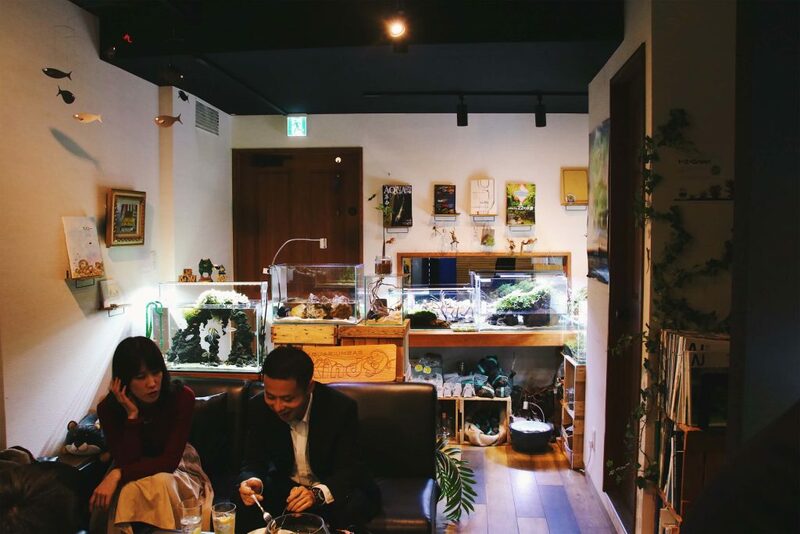 This bar seems like a cute little alternative 😉 The owner was incredibly friendly, showed us tons of his fish and taught us how to drink sake properly. Osaka is known for its amazingly fresh fish and different types of street food. You can find tons of little stands across the entire city, but there are a couple of other places that deserve a shout out! There are so many restaurants and street food stalls in Dotonbori, it’s almost impossible to choose where to eat! We accidentally stumbled upon a sushi place called Chojiro (which is apparently a chain?) 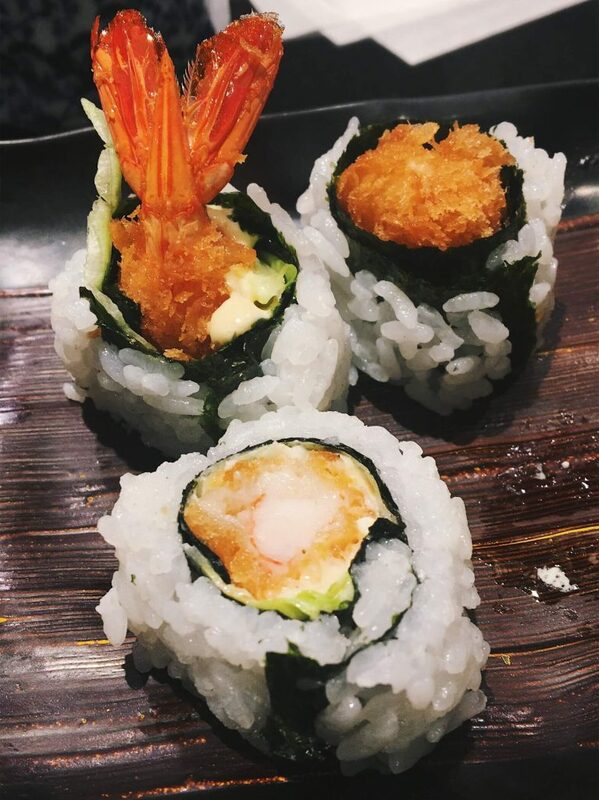 We really wanted to try some fresh sushi in Osaka, because it’s so well-known for its fish. And this was by far the best sushi I had whilst in Japan – honestly! Aquarium Bar Kind turned out to be one of my favourite spots on our trip. Because it was in a backstreet, there were no tourists. Just locals who enjoyed the bar. The owner was also incredibly friendly. We had a nice chat about where we were from, about all the fish and the bar itself. We tried some Japanese Sake, and he taught us how to drink it properly. You could really see the owner really cared about his fish and his business. The animals are cared for really well and the owner looks after his customers just as good. If you’re ever in the neighbourhood, please go check it out and support such an awesome local business! And then there is all the types of amazing street food you can try in Osaka! Here are a few that you cannot miss out on! 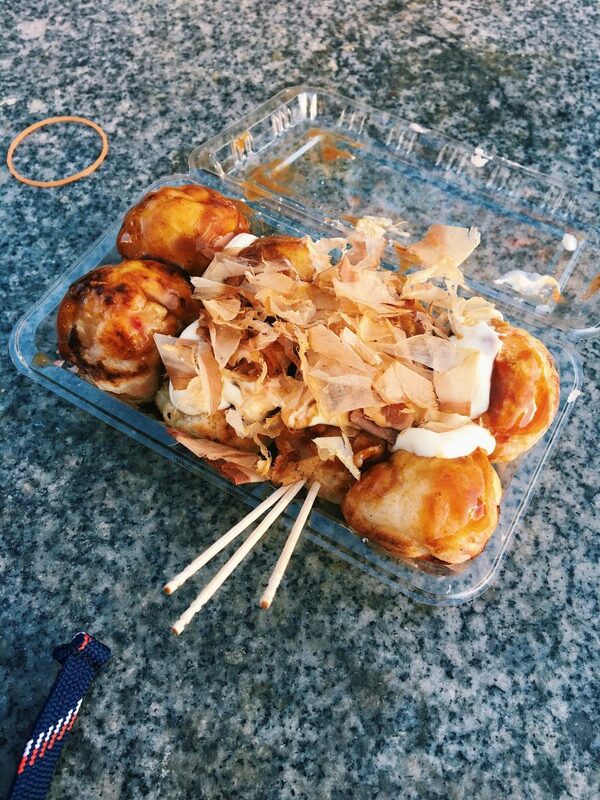 Takoyaki: This is probably Osaka’s most famous type of street food. As mentioned before, takoyaki is a doughy snack filled with octopus. They are served with some mayonaise, takoyaki sauce and bonito flakes. A must-try when in Osaka. Okonomiyaki: This is a Japanese styled savory pancake. Usually, the pancake is grilled and then topped with a variety of ingredients. 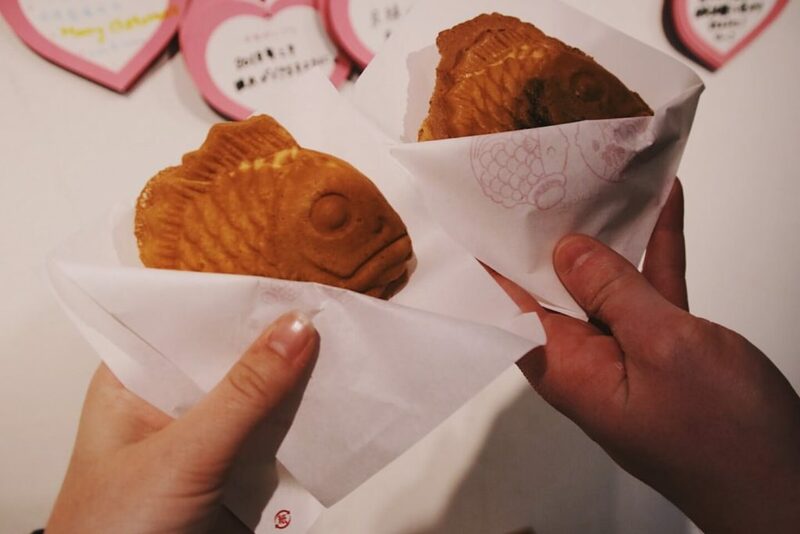 Taiyaki: A Japanese fish-shaped cake. Get it with different types of filling. My personal favourite and most common filling: red beans! This snack is the perfect sweet dessert for after your meal. During our stay in Osaka, we stayed in a beautiful hotel close to Osaka Central Train Station for three nights. We decided to stay close to the station rather than close to Dotonbori, because we were only going to explore Osaka for one day, then have a day trip to Nara and then take the train back to Tokyo. Staying close to the main station was great because we didn’t want to mess around with our suitcases, and we were still able to get anywhere really quickly because of the easy to use transport system in Osaka. The hotel itself was by far the best hotel we stayed in during our two weeks in Japan, and it was also the cheapest hotel! The room was incredibly big (for Japanese standards) and the bathroom was phenomenal! I’d 100% recommend staying in Sonezaki Luxe Hotel if you’re ever in Osaka. 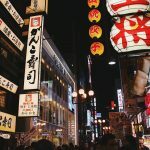 If you’re staying in Osaka for longer than just a couple of days, you might want to look for a hotel closer to Dotonbori. Just keep in mind that you’re going to have to get your suitcase to Dotonbori from Osaka Central Train Station because the Shinkansen only goes from and to Osaka Central Station.